There are a lot of things in the world that scare parents, and as much as we’d like to, we can’t be with our kids at every moment. We can guide them and advise them and hope they know what to do to keep themselves out of harm’s way. But the world of social media has brought new challenges for parents – like a recent story that took the world by storm and left parents everywhere fearful. There’s so much information, and quite honestly negativity, online that it’s hard to know what to believe. We hear horror stories and menacing warnings for parents that go viral every day, leaving us concerned for our children’s safety online. Such is the case with perhaps the biggest viral story of this year, a dark tale of a social media “game” called the Momo Challenge. The challenge appears to have been brought to light by one concerned parent in England. Her son told her he had heard about the challenge at school, she posted a warning on Facebook, and within 24 hours, the world was in a panic. 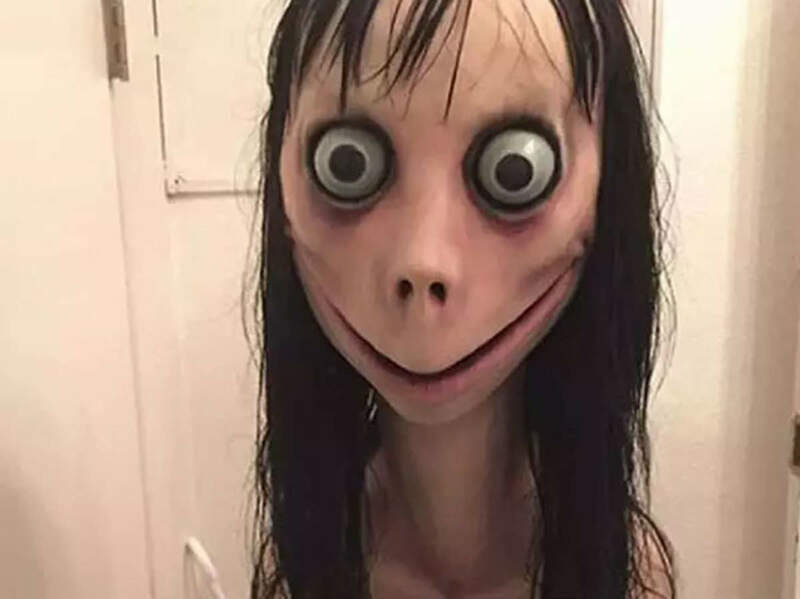 The “Momo” image – a strange, female-looking creature with bulging eyes, long, dark hair and a frightening smile — is supposedly taken from a piece of artwork created for a Japanese horror show – and it is not new. The image has been making the rounds on the internet for several years. Last year was the first time the image was linked to claims by teens that it was being sent with harmful messages. Then, as rumors often do, word spread like wildfire that Momo was encouraging children to harm themselves – even commit suicide – and that the horrifying wide-eyed face would pop up in the middle of children’s YouTube videos. The original post by the mom in England went viral, with hundreds of thousands of shares on the first day, eventually being picked up by local – and then international — news. Schools and local law enforcement were telling parents to be on the lookout. And when parents see messages like that, we panic. But here’s where the story takes a turn, one that can help parents understand the widespread panic that this image recently caused. Since the story originated in the U.K., it was investigated by the National Society for the Prevention of Cruelty to Children (NSPCC) and other watchdog groups, as well as authorities all over the world. No instance was found anywhere of any child harming themselves due to seeing the Momo image or a message related to it, and there have been no verified reports of the image popping up within any videos on YouTube. A spokesman for YouTube said the claims were completely false, according to The Guardian. The Momo Challenge has been officially called a hoax – and it is not the first or last we will see, thanks to social media’s influence. As happened with Orson Welles’ 1938 broadcast of War of the Worlds on the radio, public hysteria spreads very quickly. And now it happens almost immediately and globally with social media being used as an instantaneous way to communicate. Thousands of people share a story online, it is picked up by media outlets, and it is taken as truth before it is verified. A Dartmouth College professor, Brenden Nyhan, discussed the fake news phenomenon on social media platforms with the New York Times. In the same piece, others weighed in on the issue, saying that the public tends to have biases that are simply human nature. We tend to believe what we read and see. The hoaxes and fake news stories that we see on social media platforms are intended to keep us watching; to increase likes and shares. We tend to be fascinated with stories out of the realm of reality, and whether they are true or not, we can’t help but give them attention. And that’s what social media platforms and even mainstream news outlets count on – get our attention, keep us watching, and figure out the facts later. Experts say this widespread “acceptance” of fake news can cause far more harm than if the story had been true. And media outlets know there is no more captive audience than a concerned parent. This is not the first story of its kind in which kids have supposedly been targeted to harm themselves on social media. In 2017, another scare went viral when it was reported that 130 children in Russia had committed suicide because of the “Blue Whale” social media challenge. And recently in the U.S., the “48-hour Challenge” had parents spreading the word on social media, in a panic that their children would go missing. Apparently, that was the point of this “game” for kids – to disappear for a couple of days and get points for how many likes and shares one could rack up. Authorities sent out warnings for this one, as well. But there was not a single report of a missing child attributed to the challenge, and it too was quickly dismissed as a social media scare. So how are we to react as parents? We can’t ignore the real threats out there, but we don’t want to panic at every unproven story. Well, we’ve said it before, and we’ll say it again – staying in open communication with your children is the most important way to prevent potential danger. Monitoring all screen time and taking advantage of parental controls and screening apps are essential for younger kids who are online viewing YouTube videos or other streaming services. Older kids will rely on our advice and our presence to curb the influences of social media. We must talk to them each time we hear of one of these threats or dangerous challenges. Have they heard of it? Are kids talking about it at school? What should they do if they come across something like this online? It is difficult to monitor all social media and online activity with older kids, especially if they have their own phones and are driving or working. The need for open communication and honesty is our greatest tool to keep our kids safe. If you do see warnings or coverage of a potential threat online, do your research. Ask other parents if they have heard of it. Look for reliable news coverage of the facts. Talk to your kids and make them aware of what to do. Children’s safety groups in the U.K. are concerned that the panic over these challenges may cause another set of problems. “Even though it’s done with best intentions, publicising this issue has only piqued curiosity among young people,” said spokespersons according to The Guardian. The high profile of these challenges and threats opens the door for copycats — online predators, cyberbullies, and others — to manipulate our children by using the fear and hype to their advantage. Younger children may see or hear of these hoaxes and become fearful that they will be exposed to them. And children who are struggling with self-esteem or thoughts of suicide may use the attention of the hoax to actually harm themselves. Newport Academy reported how social media has caused an “addiction to attention” in our teens. The brain responds to social media the same way it responds to real-life connections, with a release of dopamine—a neurotransmitter that creates feelings of pleasure and works in the reward center of the brain,” experts report. It appears vulnerable kids and teens will do anything to make connections online; to get a pleasurable feeling when they receive attention. And these social media hoaxes and challenges are all about attention. They can, however, lead to serious consequences for kids who are driven by the attention to perpetuate and spread these false stories. While it may be human nature to jump to conclusions or to believe everything we see in the media, we know better than that. We must remain vigilant, do our best to check the facts – and most importantly – keep talking to our children. An open, honest, available parent is still a force to be reckoned with – even against the giant presence of social media.